SmartSites, a digital marketing agency in New Jersey, lands a spot on the 2017 installment of the prestigious Inc. 5000 List of fastest growing companies in the United States. PARAMUS, N.J., Aug. 17, 2017 /PRNewswire-iReach/ — Inc. Magazine has just revealed their annual Inc. 5000 List of fastest growing companies today, and has named SmartSites (www.smartsites.com) as one of the new debutantes in the 2017 rankings. SmartSites is ranked the 3860th fastest growing company in the nation. It is also ranked 112th on the list of New Jersey companies honored by the magazine. Inc. 5000 2017 ranks privately held companies in the country according to percentage revenue growth between 2013 to 2016. To qualify, companies must meet minimum revenue requirements, as well as have generated revenue by March 31, 2013. This year’s list has been noted to be the most competitive throughout its 36 years of history, with companies featuring an average growth rate of 481%, and has collectively created more than 619,500 jobs in the past three years. With $2.6 million in revenue, SmartSites has landed a spot on the prestigious list with a 3-year sales growth of 75.28%. SmartSites provides a wide range of digital marketing services for multiple industries, and has served a long list of clients from both Fortune 500 companies as well as local small businesses. 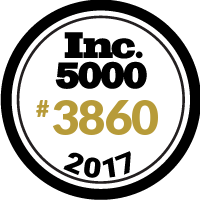 “SmartSites is extremely honored to be included on the Inc. 5000 2017, and extremely proud to makes its debut on the list. We are ecstatic that our team’s hard work has paid off, and this illustrious milestone will spur us on to achieve consistent and sustainable business growth in years to come,” said Alex Melen and Michael Melen, co-founders of SmartSites. Founded in 1979, Inc. Media is an award-winning brand that publishes monthly publications that are focused on growing companies in America. The company was acquired by Mansueto Ventures in 2005, and has won the National Magazine Award for General Excellence in both 2012 and 2014. Today, the magazine’s monthly audience reach is more than 13 million. Considered as one of the most prestigious rankings and one of the most sought after distinguished editorial awards for businesses in the United States, Inc. 5000 is a list that showcases the 5000 fastest growing companies in the country. It was first started in 1982 as the Inc. 500 list, and was later expanded to the Inc. 5000 in 2007. Besides ranking companies on a revenue basis, companies are also ranked by metro area, industry, number of employees, and more.